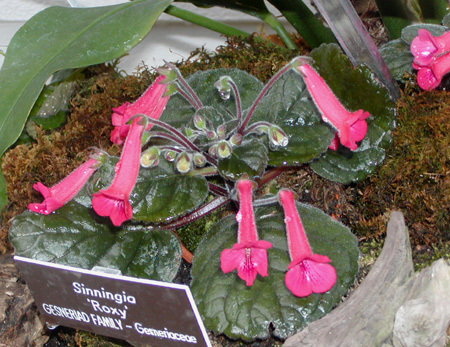 Sinningia 'Roxy' is a Mike Kartuz hybrid. He says it is S. 'Cherry Sprite' x S. 'Tampa Bay Beauty'. It is easy to see the influence of the latter parent in the flowers. I bought the plant in the picture above from him at the end of April 2008, on a tour of the best places in southern California, which included (in addition to Kartuz Nursery) Huntington Gardens, Anza-Borrega State Park, and King Leo's candy store in Julian. Although not a large plant, S. 'Roxy' is not a miniature either. Nor is it tender, having survived a Palo Alto winter outdoors, with some overnight lows near freezing. Like most other sinningias, it went dormant in late autumn, and like most, came back in the spring. In July 2009, on a tour which was a part of the Gesneriad Society convention held in Silver Spring, Maryland, we visited the United States Botanic Garden in nearby Washington, D.C. It was a pleasure to see this hybrid growing in the garden, and I imagine it must have been a special pleasure for Mike. At least a half dozen people must have told him about seeing his hybrid in the national garden. This plant has shorter internodes than mine (the one in the picture at the top of the page), suggesting that compactness depends on growing conditions. Habit Stems upright, may or may not be short. Leaves Heart-shaped, resembling those of S. eumorpha. Reverse has red hairs and network of red veins. Inflorescence Axillary cymes, one to many flowers per axil. 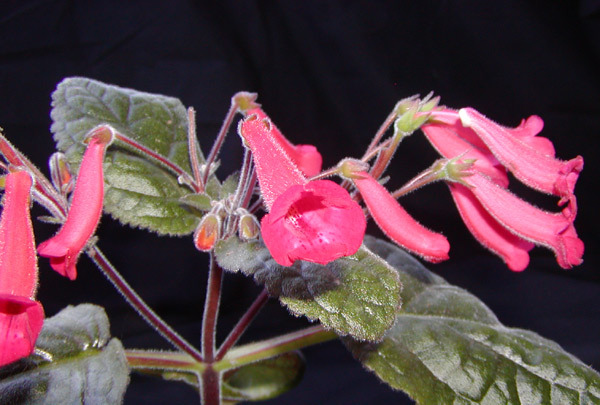 Flower Red, tubular, 5 cm [2 inches] long, with flaring lobes, three rows of darker dots on lowermost lobe. Hardiness Tubers have survived 33 F [0.5 C] in my back yard. Recommended? Yes. Culture is easy, and the plant blooms for several months in summer and autumn. Fertility My plant might be setting seed [August 2009]. According to Mike, it "appears to be sterile".